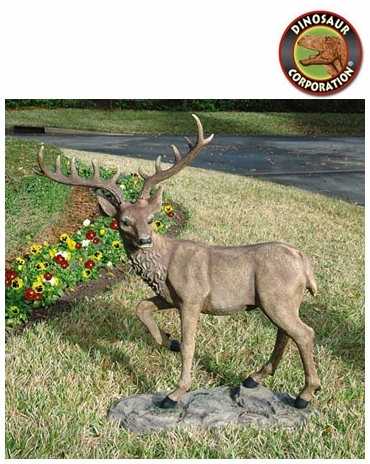 Black Forest Garden Deer Statue Outdoor Sculpture. The privilege of a visit from a majestic six-point buck isn't confined to the tradition of grand European landscapes! The quintessential garden piece, our amazingly accurate investment in garden art stands four-feet-long and over a yard tall, complete with an enviable rack of antlers. The artist has sculpted nature's details. * Size: 48" W x 15" D x 41" H.
* Simple assembly is required: base, deer and two antlers easily fit together.